This little die-cut vintage Valentine is especially cute! It features a sad train engine and reads, "I"ll just give up, if you won't be mine!" It is a Hallmark card, 1950's to 1960's vintage. 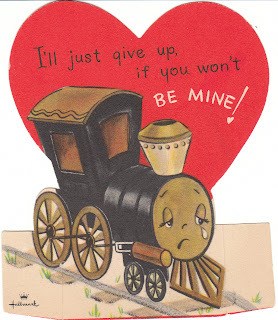 Anthropomorphic Valentines are among my favorites - they have such a unique vintage charm. This little cutie is at Birdhouse Books (train card). You'll find hundreds of more unique vintage Valentines in my store.